Environmentally friendly, all of our logs are harvested from dead-standing trees. 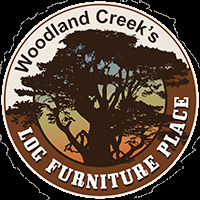 The logs used in this line of rustic furniture are hand-peeled to preserve the natural wood color and character. It comes natural but there is an option for a clear lacquer finish that brings out its natural color, or even upgrade to a honey finish. Each rustic lamp is hand-crafted to create a totally unique piece of cabin furniture. The wood in our lamps was formed into its irregular shapes by long mountain winters and other forces of nature.